Presidents like Abraham Lincoln and Harry Truman had generated public personal history separate from the reality of their lives. Andrew Jackson also falls into that group. Public memory, for example, overlooks that "he entered an honorable profession (the law), attached himself to important people, acquired property, married well (though under strange circumstances), and rose to lead the Tennessee militia." He also had success in business and politics, despite his temperament, long before he had national fame. The Heidlers point out in the Rise of Andrew Jackson that Jackson owed his political career to groups of supporters from the Nashville Junta to the "forerunners of Republican and Democratic National Committees." Jackson became a champion to "people with different hopes and disparate dreams." "The variety of views, in fact, would only multiply as the movement around the man grew." "Some wanted to eliminate all property qualifications for the vote" but "just as many supporters thought too many people already voted." "Men who wanted unimpeded territorial expansion . . . labored and propagandized alongside men who feared the opening of the West." Other Jackson supporters "lobbied for the establishment of Bank of the United States" but stood with others who "would later denounce banks." Andrew Jackson "gave his name to an age" of change that meant more than the real man. "Scores of operatives, handlers, editors, and politicians" "would deftly manage" a politician with "a nasty temper, a violent streak, and a past littered with appalling lapses in judgement." Jackson's followers sought to portray him as a senator and presidential timber "who was courtly, reserved, and unruffled by insults." "Those familiar with the authentically real Andrew Jackson were not so sure" and they definitely had challenges. The authorss create a narrative of John Coffee, Sam Houston, Henry Lee IV, William Berkeley Lewis, John Overton, Martin Van Buren, and others as the creators of an unprecedented political machine. This Jackson faction used "deliberate image building and myth making and of skillful manipulation of public perception and popular opinion." The public figure of Jackson began before the strange tale of publishing a biography not just to cash in on Jackson's great victory at New Orleans but because "the story of Andrew Jackson, hero, had many sides" and "Jackson wanted his side told first." Having as the author John Henry Eaton, ironically, set the stage for one of the last and greatest Jackson controversies. Eaton "had to tell Jackson's story without revealing too much of Jackson's history, much of which was unsavory." The popular view of Jackson and his contemporaries about the Indians, for example, "reduces a complex situation to a simplistic caricature" but Eaton made it political propaganda. The biographer, however, went silent on "the muddled origins" of Jackson's "marriage" to Rachel Donelson. The Heidlers write that the diverse negative opinions of his political enemies made Jackson stronger. He became a cause: "that the great accomplishments of the American Revolution were fading away because a delicate people, corrupted by comfort and cynical about government, could not remember the cost of Liberty." The book ends with the battles for the presidency. John Quincy Adams' followers used every Jackson scandal including the exaggerated, imagined, and real. In the end, they lost to their betters in the first truly great national campaign for the White House. 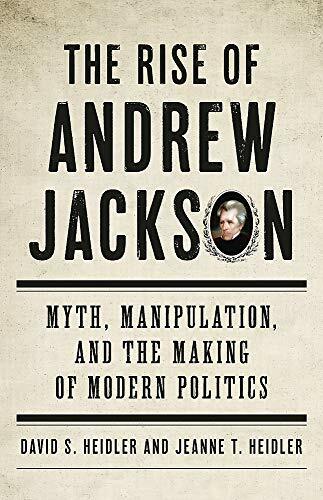 A library could exist of books on Andrew Jackson, but the Rise of Andrew Jackson makes a great introduction to the legend, the man, and his political network that created not just a president but also an epoch in American history. The Heidlers tell an engrossing story that covers a remarkably complex history in relatively few pages. It is a true page-turner.